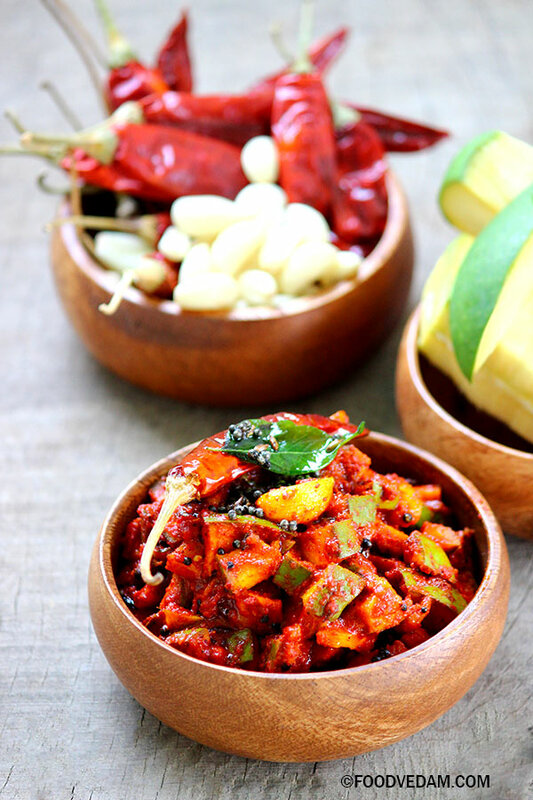 Mango pickle – this is a temporary pickle prepared with sour raw mangoes and remains fresh up to 3 days.usually this pickle is prepared during early summer before preparing the actual pickle that lasts for one year. the difference is that unlike the normal yearly pickle, tempering/thadka is added to the temporary one and also the mangoes are cut into very small pieces.Normal pickle needs 2-3 days of soaking before using.but this temporary mango pickle needs just 2 hours rest time before serving. mangoes should be hard, raw and extremely sour for this preparation.they need to be immersed in water for 15-20 minutes to get rid of the gummy layer over them.pat dry before cutting into pieces.this pickle tastes amazing when served with hot rice and ghee or with dal. immerse mangoes in water for 10-15 minutes. later rinse them thoroughly and remove gummy layer if any. slice off the top.cut the sides vertically and make into small pieces. dry roast 1/4 tsp of fenugreek seeds/methi on simmer for a minute. next add 1 tbsp of mustard seeds and roast until they start to splutter. make them into fine powder.but use only 1 tbsp of powder for this preparation. take the mango pieces into a bowl,add 1/2 tsp of turmeric powder,salt,1/4 cup of red chilli powder,3/4 tbsp of fenugreek&mustard powder,garlic paste,mix well and keep aside. take a tadka pan,pour 3-4 tbsp of oil and heat. when the oil is hot,add 1 tsp mustard seeds,1/2 tsp of cumin seeds,2 dried red chillies and fry until they start to splutter. next 2 pinches of asafoetida/hing,3 garlic cloves,1 sprig of curry leaves. pour tadka on the pickle and mix again. Your recipe is exactly like my mom’s, which ofcourse is finger licking good. I recently watched an elderly lady making this pacchadi in a slightly different way which bumped it up a notch. 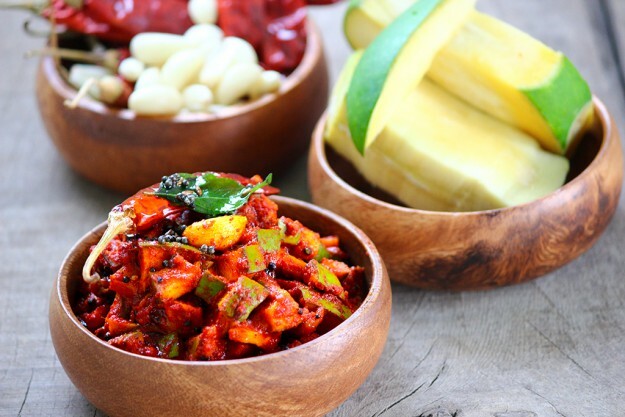 Try roasted red chillies in place of kaaram and once you powder dry ingredients, pulse a fistful of mango pieces along with garlic and add everything back to mango pieces. No garlic in popu. Give it a try and see if your family likes it too.